Featured image: This exceptionally well made corner-tang knife measures almost a foot in length and just over a third of an inch in thickness. Because it derived from a burial context and appears to be unused, it almost certainly was a “ritual” or symbolic object, reflecting the special status of the individual with whom it was buried. TARL Collections; photo by Laura Nightengale. More than 1500 years ago, an expert craftsman fashioned this unusual corner tang biface with an extraordinarily long, curved blade. Based on the color and fine-grained texture of the stone, the material he chose for this piece likely derived from the Georgetown area in central Texas. And based on the over-sized proportions and lack of wear along the blade edges or other evident signs of use, the piece had not been intended for utilitarian purposes. In 1974, excavators from The University of Texas at Austin uncovered the biface along with numerous other items—including a second corner tang biface and shell ornaments—from the burial of a young woman in a prehistoric cemetery in Austin County, Texas. Known as the Ernest Witte site (41AU36), the cemetery contained more than 250 burials, reflecting approximately 3000 years of use. The burial group from which the biface was recovered dates to Late Archaic times, ca. 650 B.C. to A.D. 450, and was notable for evidence of violence within the remains (at least five individuals died from dart point wounds). In addition, several artifacts from the same burial group were made from “exotic”, or nonlocal, materials, indicating the people were involved in a long-range trade network or “import-export” system during the Late Archaic. For example, several boatstones (likely atlatl weights) and a gorget were made of stone from the Ouachita Mountains of Arkansas, hundreds of miles distant. Corner tang knives are a distinctive artifact form, typically characterized by an off-center placement of the tang, or haft element, but varying considerably in size and blade shape. Edge wear on some suggests hafting for use as a cutting implement; others have been worn down through use and reworked into drills. Thought to originate in central Texas (based on numbers of recorded specimens in a 1930s study by J. T. Patterson), more recent tallies indicate their distribution extends as far north as Wyoming, although generally confined to the Plains. The specimen from the Ernest Witte site is without question one of the finest and largest known examples of the corner tang type. Measuring 28.8 cm in length and 5.1 cm in width, it is exceptionally well thinned, with maximum thickness of less than one centimeter. 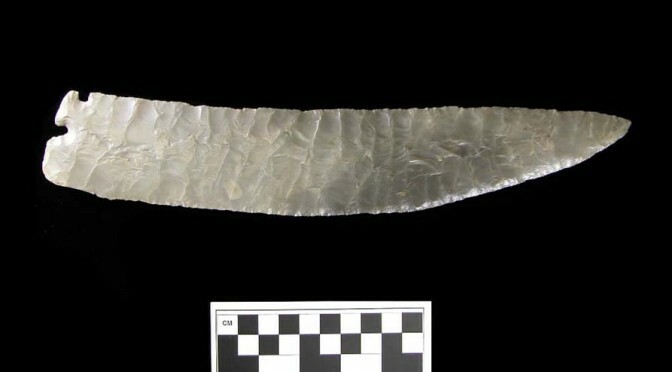 The remarkable proportions of this artifact—its length and flatness—suggested to Site Archeologist Grant Hall that the piece was made on a large chert slab which had been reduced to form a blank, rather than from a large flake. Because of its context and because it appears unused, we can conclude that this grave offering carried special significance, a ritual or symbolic function. Indeed its large blade size relative to the diminutive stem almost certainly would result in a break if the tool were hafted and used for cutting, skinning, or some other process. 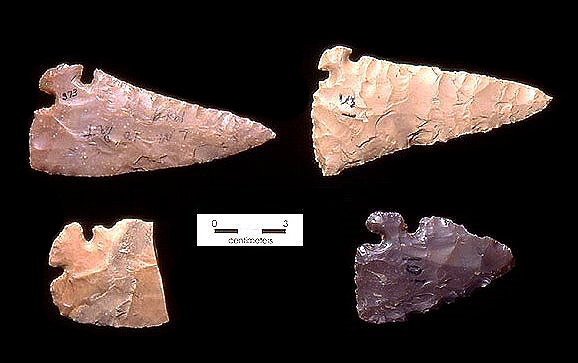 Smaller corner tang bifaces found throughout central Texas show evidence of use such as worn or beveled edges and fractures. Although very rare, large corner tang bifaces have been recovered from burials in other south Texas cemetery sites including the Morhiss Mound site in Victoria County and the Silo site (41KA102) in Karnes County. At Silo, three corner tang artifacts were found with the burial of a child who was interred beneath an adult male. Like the Ernest Witte corner tang specimens, those from the Silo site appear to be unused. Archeologists Cory Broehm and Troy Lovata wrote of the Silo Site items: “The combination of quality, size, and context of these artifacts is exceptionally rare. These pristine artifacts suggest the child was held in very high esteem.” Two additional specimens were associated with the burial of an adult male at the site. It is interesting that at both the Silo site and the Ernest Witte cemetery, some of the females were interred face down in the grave. Indeed, this rather unusual mode of burial was almost exclusively reserved for females, with only one male in Group 1 and one in Group 2 (the Late Archaic) interred in this fashion at Ernest Witte. The exceptionally crafted corner tang biface from that site, shown at the top of the page, was placed in the grave of a woman who had been interred face down. While we cannot know what these different practices and grave offerings meant to the groups who buried their dead at these and other south Texas cemetery sites, they are important reminders of the rich complexities of hunter-gatherer mortuary customs. 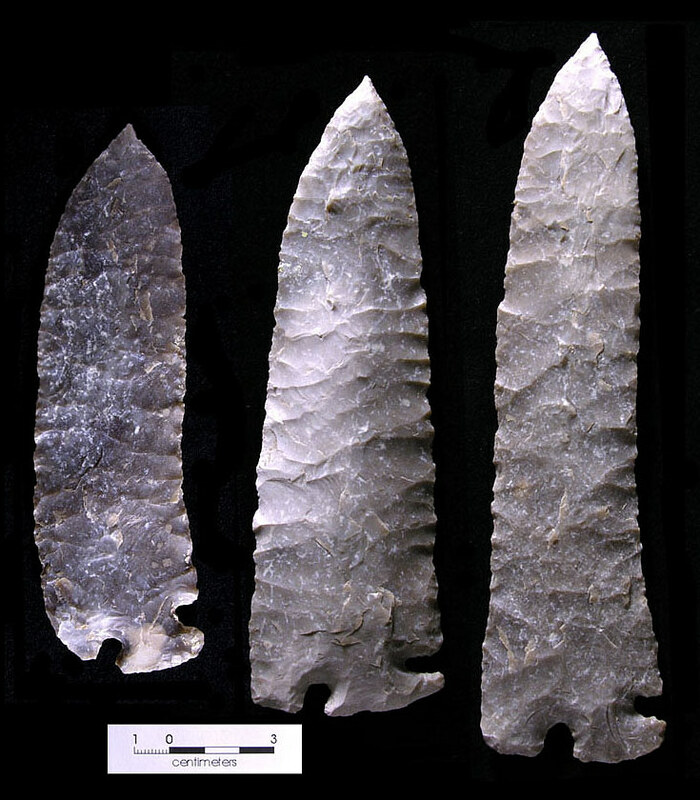 Records and collections from the Ernest Witte site are curated at TARL and are reported in Allens Creek: A Study in the Cultural Prehistory of the Lower Brazos River Valley by Grant D. Hall (Texas Archeological Survey Research Report No. 61, The University of Texas at Austin, 1981). Records and collections from the Silo site are curated at TARL and are reported by Troy Lovata in Archaeological Investigations at the Silo Site (41KA102), a Prehistoric Cemetery in Karnes County, Texas. (Unpublished M.A. thesis, Department of Anthropology, University of Texas at Austin, 1997). 2004 Five Corner Tang Bifaces from the Silo Site, 41KA102, a Late Archaic Mortuary site in South Texas. Plains Anthropologist 49(189):59-77. 1936 The Corner-Tang Flint Artifacts of Texas by J. T. Patterson (University of Texas Bulletin No. 3618, Anthropological papers, Vol. 1, No. 4); Corner-Tang Stone Artifacts of the Plains. Corner-tang bifaces from the burial of a child at the Late Archaic Silo site in south Texas. Although not as large as the Ernest Witte specimen, they are of similar quality. TARL Archives. Small corner-tang artifacts with edge-wear and other signs of use. The tools likely were used for a variety of tasks. TARL Collections. to whom it may concern: I have a tang knife similar to the ones pictured that I found in Idaho. I found it interesting that those finds were mainly from Texas. Johnson County Indiana. I also found it interesting that these are normally only found west of the Mississippi. Any thoughts?